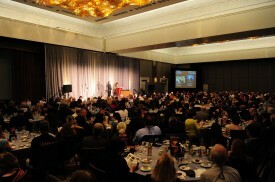 Anything that calls itself ThrillerFest has a lot to live up to. 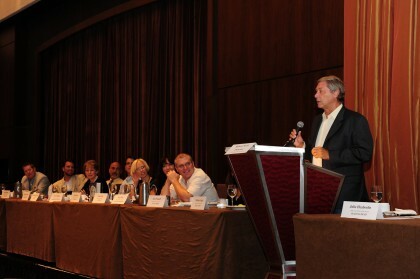 Luckily, this year’s ThrillerFest—the International Thriller Writers’ annual conference—delivered more than its share of thrills. Held in the heart of Manhattan, ThrillerFest VII was the largest and most successful T-Fest yet. 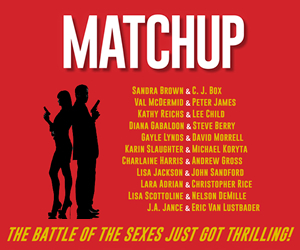 On hand were hundreds of the world’s top thriller writers, as well as scores of industry professionals, journalists, producers, aspiring writers—and let’s not forget the readers and fans. Haven’t been to ThrillerFest yet? Not clear what it’s all about? 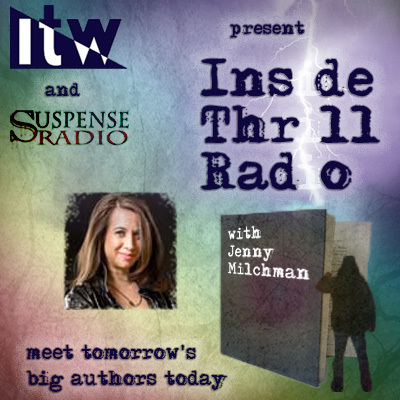 Come take a journey with both the Chair and the Membership Coordinator of ITW’s Debut Authors Program as we give some background on ThrillerFest, and then go behind the scenes—way behind the scenes—at this year’s event. Now in its seventh year, the conference is held every July in the ornate ballrooms and conference rooms of the Grand Hyatt, right next to Grand Central Station. The first two days are dedicated to CraftFest and AgentFest, with the final two focused on thriller-related panels and parties. CraftFest. This is ITW’s writing school, where beginners and more experienced writers learn from some of the biggest names in the genre. This year the faculty included more than thirty renowned storytellers—including Steve Berry, Sandra Brown, Robert Dugoni, Lisa Gardner, Heather Graham, Gayle Lynds, Phillip Margolin, and David Morrell, among others—who taught more than thirty classes on a myriad of writing topics. As WRITER’S DIGEST reported, even the conference’s Spotlight Guests shared their writing secrets: Catherine Coulter taught a class on “Writing Sharp, Fast, and Deadly”; Lee Child taught “Tell, Don’t Show: Why Writing Rules Are Mostly Wrong”; John Sandford taught “Techniques and Ideas to Burnish Your Text”; and Ann Rule taught “All You Need to Know to Write Great True Crime”. CraftFest is the Ivy League for learning the craft of thriller writing. But the classes aren’t limited just to writing techniques. Author and marketing expert MJ Rose and a book publicity expert taught a course on marketing and promotion; Jamie Raab and Mitch Hoffman of Grand Central Publishing gave advice to aspiring writers from the publisher and editor’s perspective; and Kathleen Antrim and Jon Land gave an hour-long course on how to pitch an agent. Speaking of pitching . . .
AgentFest. Don’t want to spend months sending out cold query letters to literary agents? On the second day of the conference, the country’s top agents spend the better part of an afternoon hearing pitches from writers looking for their big break. This year more than fifty agents participated, some blogging previews and recaps of the event. 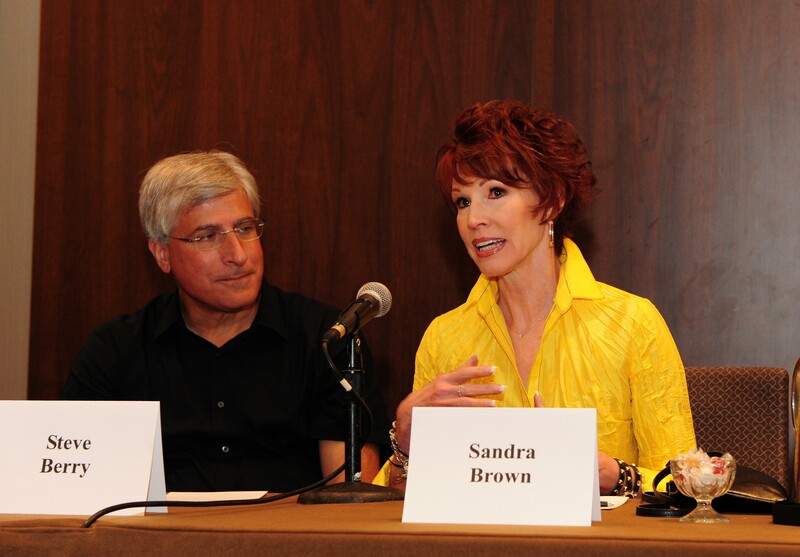 Success stories from AgentFest abound, and many published authors roaming the halls at ThrillerFest VII got their start at past AgentFest events. ThrillerFest. Most years, ThrillerFest follows a similar schedule: Thursday night there’s an opening cocktail party; Friday includes panels, Spotlight Guest interviews, and more cocktails, camaraderie, and parties; and Saturday features the Debut Authors Breakfast in the morning, panels through the afternoon, and the Thriller Awards Banquet that night, followed by an after-party, to keep the excitement going. As in the past, between the panels, bestselling authors interviewed the conference’s Spotlight Guests, panel participants gave book signings, and Audible, Grand Central Publishing, HarperCollins, Kensington Publishing, Random House, and Writers House provided coffee and refreshments. And let’s not forget the Friday night Love Is Murder cocktail party, celebrating the third Thriller anthology of short stories published by ITW and edited by Sandra Brown. PUBLISHERS WEEKLY gave the book a starred review and ITW projects that it will become the most successful of its anthologies to date. 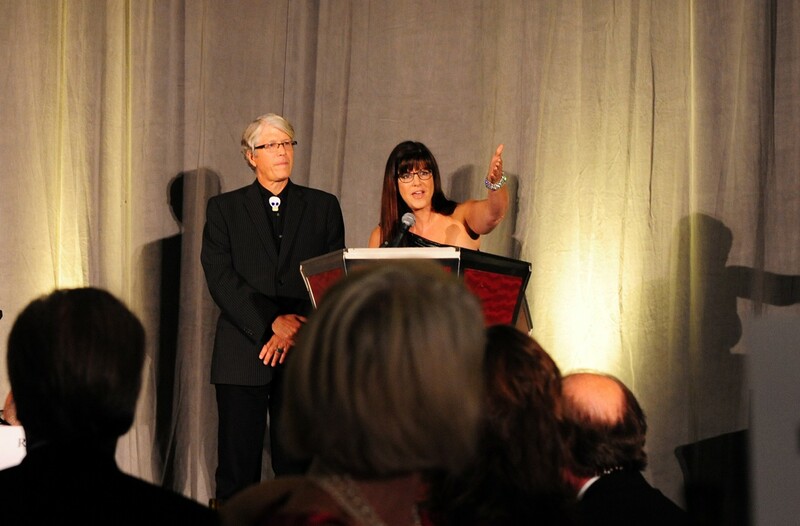 ITW also presented the prestigious 2012 Thriller Awards: Stephen King won Best Hard Cover Novel; Jeff Abbott, Best Paperback Original Novel; Paul McEuen, Best First Novel; and Tim L. Williams, Best Short Story. And then, after one more party to share email addresses and goodbyes, it was over. Bags were packed, rooms checked-out, and bleary-eyed authors filled the Grand Hyatt lobby on Sunday morning to head back to the business of writing. 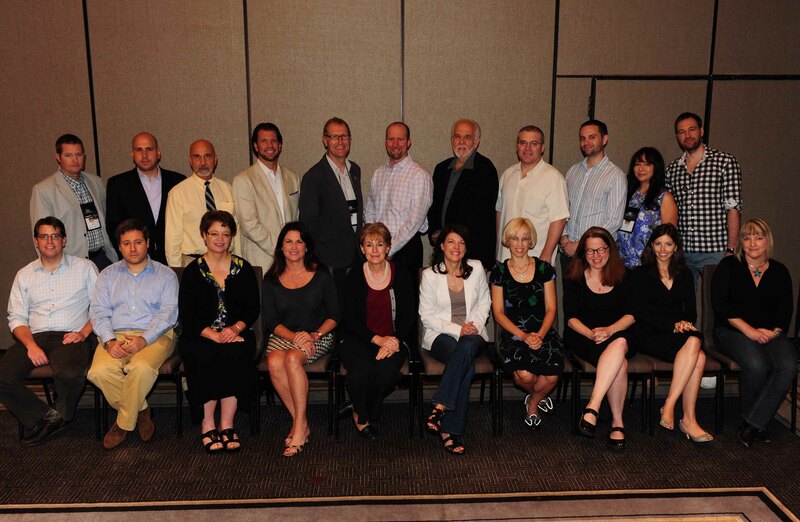 So, those are the facts on ThrillerFest and a short recap of this year’s conference. Here’s a further look as seen through the eyes of a first-timer at the event. I think it’s because the rooms and halls of the Grand Hyatt are filled with real, live heroes and heroines. 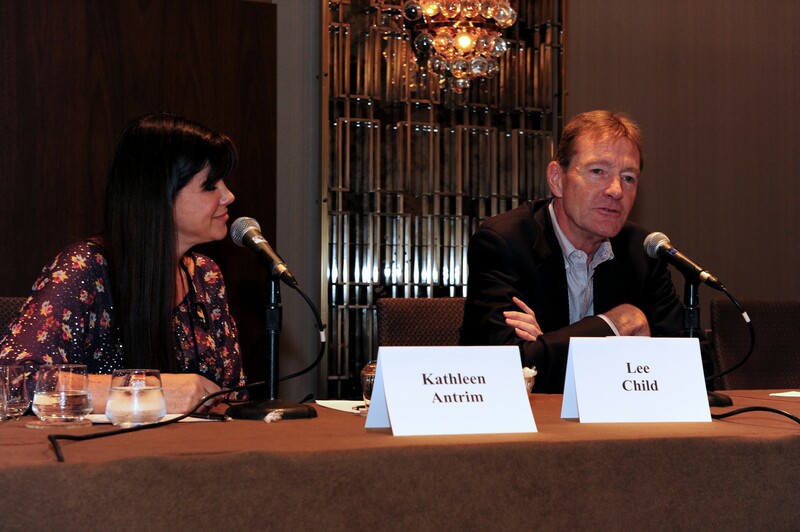 Whether you’re a writer or a reader or both, coming face-to-face with Lee Child, MJ Rose, and others is bound to be thrilling. So is raising a glass to Richard North Patterson as he utters words that would keep any writer trudging along this sometimes arduous path of a writing career. Or being able to call Sophie Littlefield and Bill Landay and Carla Buckley ‘friend’ after having drinks with them at one of the cocktail receptions. But this is making it sound like all we writers do is stand around and drink. Not so! Sometimes we sit down. For instance, at the panels. The one I was most geared up for focused on thrillers that feature ordinary people in extraordinary situations. 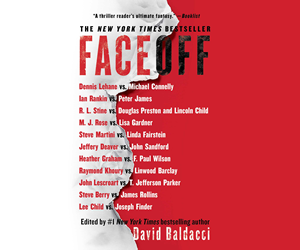 The lineup consisted of six extraordinary authors including Linwood Barclay and Eriq La Salle of ER fame, who, I was fascinated to learn, had just written his first thriller. Joseph Finder moderated. 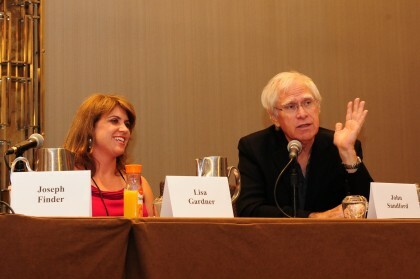 In this panel, as at all the others I attended, humor dominated both the Q and the A. Thriller writers are a funny bunch. The fearsome things appear on the page. 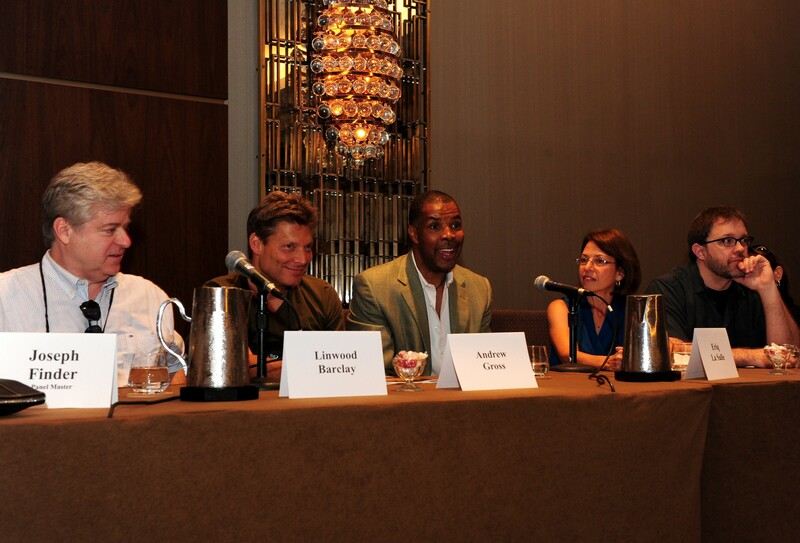 I also got to moderate a panel—talk about glamour. Or Cosmo anyway. Really—Kate White, editor-in-chief of COSMOPOLITAN magazine, was part of the lineup, along with Carla Buckley, Pam Ahearn, Tosca Lee, Tim Wohlforth, and Tom Young. Talking to these successful writers and publishing-folk (Pam is a literary agent) ran the risk of scaring me as much as a great thriller does. 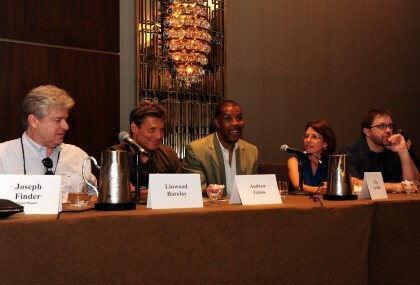 But the panelists were so entertaining, informed, and witty that they made the whole thing more fun than intimidating. 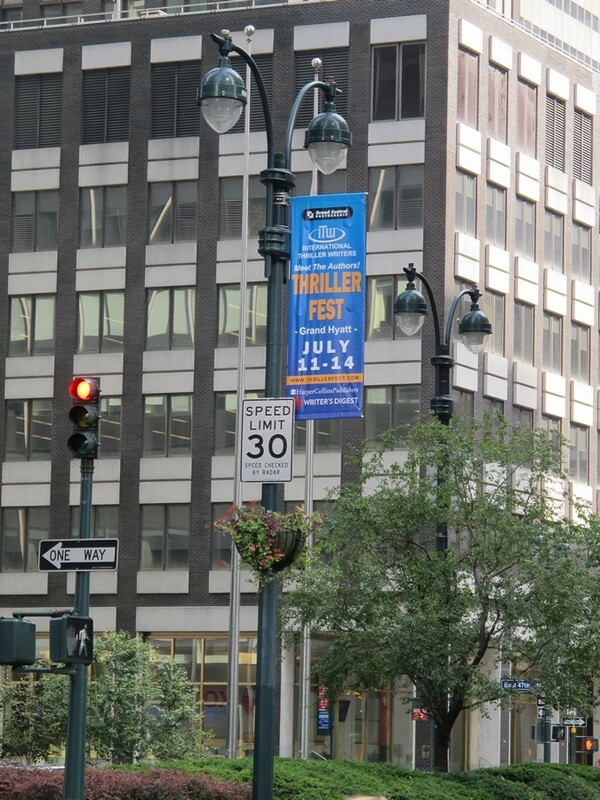 What else likens ThrillerFest to taking a walk down that Hollywood street with all the inlaid gold stars? Well, nothing makes a person feel like a star more than the flash of a camera, and when the photographer is bestselling thriller writer Alan Jacobson, not only are the photos likely to be great, but so is your mood after being picked to appear in a shot. But I digress. You can see several of Alan’s great pics right here in this piece and even more in this gallery. Thursday night there was a welcome cocktail party sponsored by Random House, which featured editors and publishers and agents in addition to authors. There was a bountiful table of food, but the real draw was the feeling of going backstage on opening night of a Broadway play. Here were the stars of today and tomorrow—and the people producing them. If you were an aspiring author, it was an opportunity to learn what kinds of books are selling. And to chat with the people who just might make your dream come true. Friday evening, after another cocktail party, the Debut Authors went out for dinner. 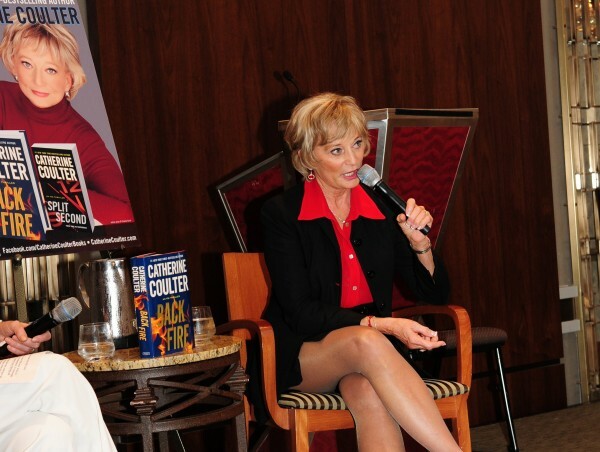 We were delighted that a special guest, Janice Gable Bashman, thriller writer and managing editor of THE BIG THRILL, joined us. You know what it’s like when you find an old friend or long lost relative on Facebook and meet up with him or her in person? This dinner was like that . . . times twenty. The Debuts had so much to say to each other that you never would’ve guessed none of them had ever traded smiles—or bites of salad—before. There’s something about hanging out with people who really, truly understand you because they live the same life and want the same dream as you do. It’s an experience that can’t be duplicated. On Saturday morning, the Debut Breakfast took place. Twenty-one brand new authors up on a dais with beribboned gift bags before them, and exactly one minute to talk to hundreds of assembled guests. What would they talk about? Oh, not much. Just their lifelong dream. How the Debut Class of 2012 rose to the occasion! Not a one droned on and on about their book. (We all know that doing that is a drone, right?) Rather, they enticed us with a little bit about who they are and the reason they had fought so hard to scale this mountain. After hearing that, I think all of us wanted to read the books that were the result. And ThrillerFest, particularly this Breakfast, was described as a moment everyone had been waiting for. One author said that she had attended her first Breakfast four years ago and said to herself, “I will be up on that stage one day.” And she was. Even though she had to fly in from another conference in California to do so. When they asked about their hook. A billboard for my book. And don’t get me started on R.L. Stine. Dear R.L. Stine. You are my second favorite author. Seriously, the regard Bob Stine brought for his young readers was an inspiration, and like all the best humor, we walked away from his speech thinking a little more deeply about this business that draws us in, pulls us, yanks us like a noose around the neck. Then there were the awards. These were a little like the Oscars crossed with American Idol. Who would win and make that lovely, trembling walk to the stage? Who would sink back in their seats, tension draining, reminding themselves—and it’s true—that it was an honor simply to be nominated? 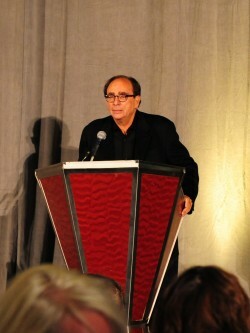 The final event of ThrillerFest that stands out was a goodbye cocktail party late Saturday night. (But seriously. We don’t just drink). And in addition to all those assembled heroes and heroines, someone else came to after-dinner. Cheryl Ladd, whose husband, music producer Brian Russell, had just finished writing his first thriller. Yes, a former Charlie’s Angel showed up. I said this was going to be a thrill.